The Del Oro Science Department addresses the needs of every student for basic scientific literacy through in-depth study of scientific principles and the utilization of appropriate technology in hands-on laboratory experiences. Coursework in all science classes prepares students for college by reinforcing the foundational academic disciplines of reading, writing, mathematics and communication. 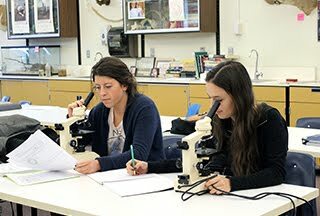 With an array of standards-based course offerings; including Anatomy, AP Environmental Science, Chemistry and several Ag Science courses, it is also the department’s goal to introduce our students to the variety of biological and physical science opportunities in both post-secondary education and the workplace. Students planning to attend a 4-year college should complete a minimum of Biology, Advanced biology and chemistry. Physics and AP science courses are also highly recommended for students interested in pursuing a degree in science or engineering, or who plan to apply to some of the more competitive universities such as any of the UC schools. Students who plan to attend a 2-year college, technical school, or transition directly to the workforce meet graduation requirements by completing one life science course and one physical science course. major organ systems of the human body in detail. This course contains a great deal of laboratory work with dissections. Quality work and study habits are needed. This course is recommended for all students interested in learning about the human body and especially those students majoring in science, medicine, and health related fields. This course is designed to meet the physical science graduation requirement. The major topics of this course are oceanography, astronomy, geology, and weather and climate. conjunction with the technology department). Advanced Biology is a study of the workings of living organisms. Cellular organization and processes, advanced topics in genetics and biotechnology and the topic of evolution will be stressed. Students are required to keep an organized notebook, perform lab work and complete projects. Adv. Biology is a course designed and recommended for students planning on attending college. Chemistry provides a rigorous introduction to chemical systems. The main units of study include atomic structure, nomenclature, stoichiometry, reaction types, solutions and gas laws. Mathematical modeling tools will be used to gain a better conceptual understanding of underlying physical systems. Chemistry prepares students to take college chemistry which is required for a wide variety of majors. Prerequisite courses: A grade of C or better in Advanced Biology or AP Biology and Integrated math 2. Successful completion of this course will satisfy UC/CSU “D” Lab Physical Science. usage, pollution sources and solutions, ecosystems and energy flow, population problems and solutions, resource and energy sources and usage. In addition, the course will provide students with opportunities to measure various environmental parameters and use the data collected to arrive at conclusions about the environmental health of certain habitats. Successful completion of this course will satisfy UC/CSU “G” elective requirements. the mole concept, gas laws, stoichiometry, redox, acid base theory, equilibrium and chemical bolding. course. The projects include: Design and Construct a Rocket, Build a Paper-Plate Speaker, Build a Popsicle Stick Bridge, and Design and Build a Radio-controlled Robot powered by 18V drill motors.